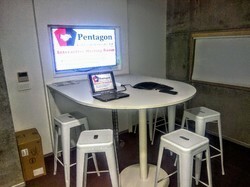 Boardrooms & Training Facilities. Video Conferencing & Control Systems, Large Format Projection & Digital Theatre Fit-outs. Defence Contracting Specialist. We provide an all-in-one or ‘Turn Key’ Audiovisual service which can include personalized on-site consultation, audiovisual systems design including the supply of AV hardware (often specialist or custom), programming of automated control, logistics & project management, installation, and ongoing servicing and maintenance programs (where required). Regardless of size, your meeting rooms are where decisions are made, deals are signed, and breakthroughs emerge. As the hub for communication, your room should be done your way. Check out video conferencing, collaboration and audio solutions from a few of our partners like Polycom, Cisco, Avaya, StarLeaf and LifeSize – or start designing your room today! We can design a solution to meet your Boardroom, meeting and training rooms and public display AV requirements. Years of combined knowledge and experience enable us to bring together integration technologies from companies such as AMX, Crestron, Extron and Kramer to provide simple to use, yet highly intuitive systems. 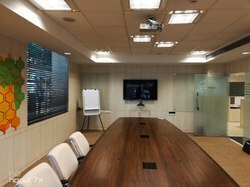 Today’s Boardroom AV Designs typically involve a Presentation Switcher, which is designed to simplify AV control and distribution in medium and large conference rooms. A Presentation Switcher is perfect for any room with a mix of analog and digital sources, multiple displays, or rooms that require support for video conferencing. B&H can provide AV design, equipment supply, and installation services for your company, backed by maintenance and support services. We help implement all-digital, networked AV technology which allows centralized control over lighting, HVAC, sound, projection, and video conferencing elements to allow the smooth execution of events with the help of smaller teams. 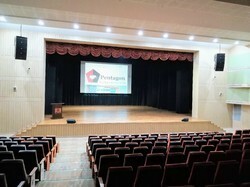 Pentagon begins with the auditorium sound system design and integrates elements like large screen projection, lighting management, control systems, and video conferencing that allow smoother management of a wide range of sub-systems. By deploying customized auditorium speakers with the right speaker placement, our sound engineers ensure evenly distributed sound along with effective noise control and vibration isolation to minimize the effect of external and mechanical noises. Centralised management of the auditorium is enabled via touch-based controllers which allow event managers to stay in control even in the high-pressure environment that high-profile live events inevitably create. These control systems can be integrated with almost any electronic or electrical system including HVAC, sound systems, lighting, drapes, AV devices, projectors, screens, cameras, video conferencing systems etc.